SAN JUAN -- Arellano got a huge bounce back win, flushing away JRU in a second half breakaway for a 79-70 decision in the second game of the Friday tripleheader today at the FilOil-FlyingV Centre. 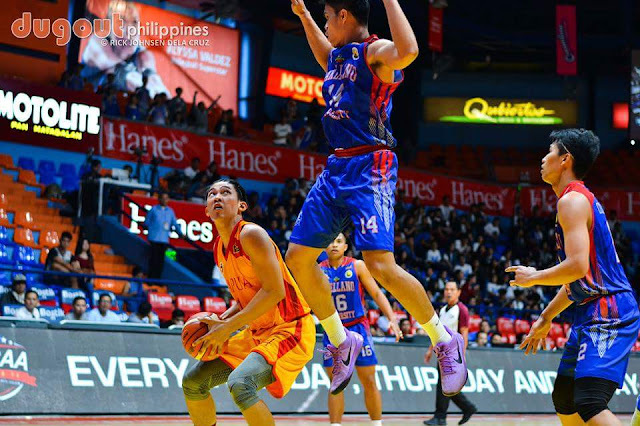 The Chiefs started their comeback trail in the second quarter, then took over in the third to keep the Heavy Bombers winless after six games, while they move to .500 with an even 3-3 card. Maui Sera Josef came off the bench and scored a career high 17 points as he was just a rebound shy of a double-double as four other Arellano players are also in double figures, as they led by as much as a dozen in the payoff period. Jed Mendoza led all scorers with 23, with 9/13 coming from inside the arc but had to leave the game shaken up after being hit at the back of his head by Sera Josef's knee with two minutes to go. Arellano 79 – Sera Josef 17, Canete 15, Alban 14, Dela Cruz 14, Segura 10, Concepcion 6, Alcoriza 3, Bayla 0, Codinera 0, Dela Torre 0, Ongolo Ongolo 0, Sacramento 0, Santos 0, Villoria 0. JRU 70 – Mendoza 23, David 9, Estrella 7, Bordon 6, Dela Virgen 6, Mallari 6, Esguerra 5, Silvarez 4, Miranda 2, Santos 2, Ramos 0. Quarter scores: 12-16, 34-36, 54-50, 79-70.